An Android app that allows you to transfer files from device to device. It is the fastest file sharing app in the world. There are millions of Android users using SHAREit to share files. By using this app you can transfer file from your Android smart phone. It allow users to share files offline. Now you can transfer files from your device without using any network. Transfer photos, songs, videos, documents, installed apps, APK files, exe files, and much more with SHAREit. It is the fastest files sharing app as compared to Bluetooth. 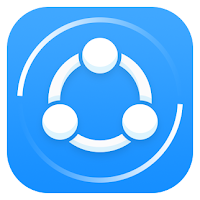 SHAREit is free file sharing app and you can connect it with your PC. You have no need to connect cables to transfer files to your PC. You can easily send files from your phone to your PC and from your PC to phone without cabled by using SHAREit. SHAREit is very simple app and it is very easy to use. You have to just install SHAREit on your device. When you open it on your phone it gives you only two option (Send, Receive).